Ginger is a hot fragrant spice that works effectively as a remedy for an upset stomach. It gets rid of the discomfort in your abdomen that is a common symptom for so many people. Ginger has been used to treat many health problems over the years, including a stomach ache. This is the pain in a person’s belly that is felt anywhere between your chest and groin, caused by acute indigestion and gas problems. 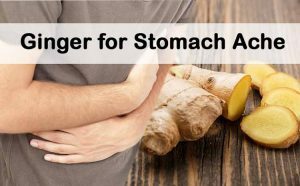 In the article below you will find some methods that have been shown to cure an upset stomach, all of which use the healing spice of ginger. Is Ginger good for stomach ache? Ginger has many amazing properties that help in treating any stomach related problems, especially stomach ache. Ginger has an anti-inflammatory property that helps to reduce the inflammation which causes pain in the stomach, just as similar as NSAID’s. It eases the inflammation that gives relief from the indigestion and hyper acidity. It is a mild stimulant that promotes blood circulation and aids for better digestion. It contains a strong anti-oxidant called gingerols and shogaols that will decrease the free radicals production and also the damage to the body. It also aids muscles to relax intestinal track, which gives relief from the stomach pain occurring due to indigestion as well as gas. It helps the food flow smoothly through the digestive tract by allowing better absobtion of nutrients. It will effectively eliminate any extra gas from the intestinal tract. It stimulates the production of saliva, bile, gastric juices, etc. which aids in better digestion and prevent gas. It relaxes muscles and relieves cramping that lessens the chance of backed up food in the digestive system. It improves blood circulation by boosting blood flow and reducing inflammation. Ginger is a useful home remedy that gives relief from stomach pain. You can follow any of these methods or simply eat a piece of ginger either in raw, cooked, candies, crystallized form. Cut fresh ginger into small slices. Sprinkle some salt them all. Chew these gingers slices as often as possible throughout the day. Or simply add this ginger spice in your recipes. Wash, peel and cut a one inch sized ginger root into thin slices. Cut 3 – 5 small carrots and an apple into pieces. Drink this juice regularly, by adding a small amount of lemon juice. Crush a small piece of fresh ginger to extract its juice. Mix a teaspoon of juice with 1/2 teaspoon of clarified butter (ghee). Stir it well and consume regularly to get rid of pain. Does Ginger Ale help Upset Stomach? Natural ginger ale is full of medical compounds of ginger root with sugar and carbonation of soda, all of which help to calm an upset stomach. Ginger ale is an organic soft drink that causes carbonation to relieve pain and discomfort. The air bubbles cause an alleviating effect that calms the upset stomach. Ginger ale with water or fruit juice helps to replenish and restore the fluids in the body during intense upset stomach. Ginger ale is a classic soft drink which combines the medicinal properties of ginger root with the combination of sugar and carbonation of soda that helps to release the gas from stomach to relieve stomach pain. It is also known as anti-emetic and alleviator of nausea and other stomach disorders. Add a cup of finely chopped ginger to 2 cups of warm water. Let it steep for about 5 minutes and allow it to cool for 20 – 25 minutes before straining. Let the sugar dissolve completely then leave aside to cool.Mix 1/2 cup of ginger water, 1/3 cup of simple sugar syrup and 1/2 cup of club soda. Squeeze a lemon wedge for additional flavor and mix it well. Add 1 ½ ounce of finely grated fresh ginger, 6 ounce of sugar and 1/2 cup of water into a two-quart saucepan. Place over a medium high heat and stir it until the sugar has dissolved. Remove it from the heat, cover and allow it to steep for an hour. Pour into a bowl using a fine mesh strainer. Press down to get all the juice out of the mixture and chill. Pour into a 2 liter plastic bottle and add 1/8 teaspoon of active dry yeast, 2 tablespoons of freshly squeezed lemon juice and 7 cups of water. Place the bottle cap and shake it gently to combine all the ingredients and leave the bottle for 48 hours at room temperature. Open it to check for the carbonation. If it achieves the desired amount of carbonation then refrigerate the ginger ale bottle. Use this ginger ale drink to get relief from stomach pain and upset stomach. You can store it in the fridge and use it whenever you suffer from the pain. Wash and chop 2 – 3 ounces of fresh ginger root. Put in a pan and add 3 tablespoons of lemon juice and orange juice, 3/4 cup of sugar in 1 ½ quart of water over a medium heat. Simmer for about 30 minutes to an hour, mixing all the ingredients. Remove it from the heat and strain. Mix this brew with the other 3 quarts of water and allow to cool. Take a small jar and add 1/8 teaspoon of yeast and 1/4 cup of warm water. After 15 minutes, add this yeast solution to the lukewarm brew and allow it to sit for 10 – 15 minutes to cool completely. Bottle it up and drink when needed. Ginger treats stomach gas effectively by releasing the gas through bloating and prevents gas pain. Blend a fresh ginger piece to extract its juice. Mix well in a glass of warm water and then drink. Or simply rub the ginger essential oil that mixed with any carrier oil on your stomach and massage it for few minutes. Grind a teaspoon of each of ginger powder, black pepper, dried mint leaves and coriander seeds to make a fine powder. Take a teaspoonful of this powder twice a day. You can prepare this powder in large quantities and store in an air tight container. Mix equal quantities of ground ginger, fennel and cardamom to make a fine powder. Add a teaspoon of this to a cup of water and a pinch of asafetida. Mix well and drink this once or twice a day. Ginger is also used to treat upset stomach and gas. Try these methods to get complete relief from the indigestion and pain in the abdominal. Mix a teaspoon of freshly grated ginger with a teaspoon of lime juice. Eat this immediately after meal twice a day. Or chew ginger candies throughout the day for a faster relief. This process is used to treat stomach gas, stomach ache and upset stomach and gas problems. Eat 1 gram of freshly peeled ginger per day. You could also add ginger as a spice in your food to get relief from upset stomach. Cut fresh ginger into slices. Sprinkle salt on every piece. Chew these as often as possible. This ginger can also be taken in the form of pills, ginger ale or tincture etc. Candied, chews or crystallized ginger can help with car sickness. Making sure that the products you pick contain pure ginger, not just flavourings. Add a teaspoon of ginger juice and black pepper powder to lime juice and mix well. Consume this to relieve from the pain and gas problem. Mix 1/4 teaspoon of grated ginger, a tablespoon of soy sauce (tamari), 2 tablespoons of rice vinegar, 4 tablespoons of raw sesame oil and a smashed clove of garlic. Use this as salad dressing regularly. Mix 2 teaspoons of ginger juice, a teaspoon of lemon juice and a pinch of table salt or black salt. Consume this with or without water. Take when you feel the symptoms coming on. Slice fresh ginger into 1/2 –inch thick pieces. Add a little butter and cook it for 3 – 5 minutes over low heat on a skillet. Transfer onto a cookie sheet and allow it to cool and harden for about 30 – 40 minutes. Peel 2 fist –sized pieces of fresh ginger (1 – 2 lbs) and cut into thin slices. Add enough water to ginger in a pot and heat over medium heat. Bring to a boil and simmer, partly covered, for 20 minutes. Let it cool and drain. Make sure to keep the water. Now add equal quantities of cooked ginger slices and sugar in that pan along with 1/4 cup of extracted water and a pinch of salt. Boil for few minutes over medium heat till it becomes thick syrup. Separate the slices and dry them on a rack (overnight or 7 – 10 hours). Pour 2 cups of water into a saucepan and heat it for few minutes to boiling point. Add 4 teaspoons of minced fresh ginger and 1 ½ cup of baby carrots. Mix and cover, cook over a medium heat for 20 – 25 minutes. Let it cool before blending to a liquid. Stir in buttermilk and salt. Consume as often as you feel the need. Add 2 teaspoons of fresh ginger root to 1 ½ cups of warm water. Stir it and steep for 10 – 15 minutes. Mix with a little honey and drink2-3 times a day. This process is also used to treat stomach cramps. You can also use one inch piece of ginger (either grated or dried) in a cup of warm water and follow the same process. Peel an inch of ginger. Add 2 cups of water to a pan. Bring this water to boil and add the ginger slices. Cover and reduce the heat to simmer for about 20 minutes. Add a small amount of honey or lemon. Drink regularly, you will experience relief within 10 – 15 minutes after drinking this ginger tea. Fill a mug with water and microwave for 2 – 4 minutes. Place a tea bag of ginger tea in it. Let it steep for about 5 minutes or longer for more strength. Remove the tea bag and add 3 drops of lemon juice. Sip this ginger tea slowly to get relief from upset stomach. Boil 3 ¼ cups of hot water and 1/2 cup of finely chopped fresh ginger. Add 2 tablespoons loose black tea leaves, stir and cover. Allow it to sit for about 3 – 5 minutes. Stir in 1/2 cup of evaporated milk and 1/2 cup of sweetened condensed milk. Pour through a sieve into a blender and blend until foamy. This combination will work well in curing the upset stomach as ginger stimulates digestion, lemon is alkalinizing and honey is soothing. Bring 2 cups of water to the boil. Add a 1-inch piece of fresh ginger root (peeled and sliced thinly or ground), two 1 –inch pieces of lemon peel and juice of half a lemon. Mix all the ingredients well and simmer it for about 5 – 10 minutes. Mix 1/2 teaspoon of dried sage, 1/2 teaspoon of ground ginger and a teaspoon of sugar and add to a cup of boiling water. Peel some fresh ginger and cut it into thin slices. Add 2 – 3 cups of sugar and bring to the boil. Simmer for about 4 – 6 hours and allow it to cool. Drink half a cup a few times a day or add a few spoonfuls to your tea. Ginger beer is a non-alcoholic beer that gives relief from many problems like upset stomach, acid indigestion, heartburn, GERD, nausea, etc. Pound 4 oz of dried ginger root using meat tenderizer. Boil in 1/2 gallon of water then remove from the heat. Mix a packet of dry yeast with the juice of a lemon and then add this to a cup of warm water. Pour the two mixtures together. Add another half gallon of water to the solution and leave it to brew for 24 hours. Strain to remove the ginger root and add sugar as per your taste. Dissolve the sugar completely and refrigerate. Grate or dice 2 tablespoons of fresh ginger finely. Put in a small jar and add a squeeze of a lemon. Allow it to soak for an hour. Strain the juice into a jar. Drink as and when you want. Wash 3/4 lb of ginger root and cut into small pieces. Blend 3 cups of water, cup of sugar and ginger. Keep in a dark, dry place for about 24 hours. Strain the mixture and add water to bring it up to 2 quarts. Add 2 ounces of lime juice and 2 cups of sugar. Mix and drink to get relief. Follow these tips and warnings for an effective and safe relief from stomach pain and other stomach ailments. Regular intake of ginger in any form in your food will help a lot in curing all the stomach disorders. You can take this either in the forms of tincture, capsule, tea or extract. Ginger can interfere with certain blood thinning medications like aspirin, Coumadin, etc. so it’s better to take the advice from the doctor before using it for stomach problems. Avoid giving ginger to children under 2 years. Adults should take the dose of 4 gm. of ginger per day and pregnant women should take up to 1 gm. Consult with a healthcare professional before using ginger tea regularly if you suffer from heart problems, diabetes, ulcers and bleeding disorder. Breast feeding women should avoid taking it. Taking large amounts of fresh ginger may irritate the mouth, oesophagus and stomach. Carbonated drinks like ginger ale should be taken flat and drink ginger tea that is caffeine free. Avoid ginger ale if you’re hyperglycaemic, unable to consume sugary beverages, are experiencing an allergic reaction, nausea or heartburn. Only consume 4 grams or less of ginger. Consuming more than this can lead to many health problems. Try other pure ginger products like candies, capsules, pills, tincture, etc. as an alternative. Have you tried any of these methods? Do you know any other methods to get rid of the upset stomach? Please share your experience with us. You might be interested in knowing how to treat an stomach ache with other home remedies such as apple cider vinegar and baking soda. We’ve rounded up posts for you to check out! Ginger can interact with some pain killers so it is better to consult your doctor before taking it. Can ginger be taken by pill form? What should the dosage/strength be?